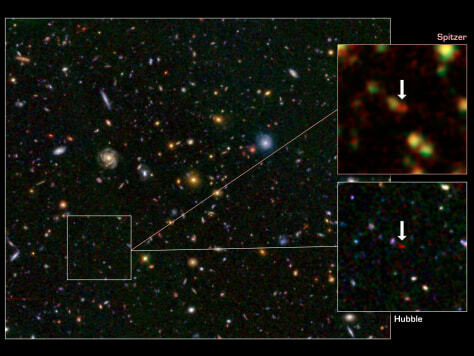 This image from the Hubble and Spitzer space telescopes shows one of the most distant galaxies known, called GN-108036, dating back to 750 million years after the Big Bang that created our universe. The galaxy's light took 12.9 billion years to reach us. The galaxy's discovery was announced on Dec. 21, 2011.